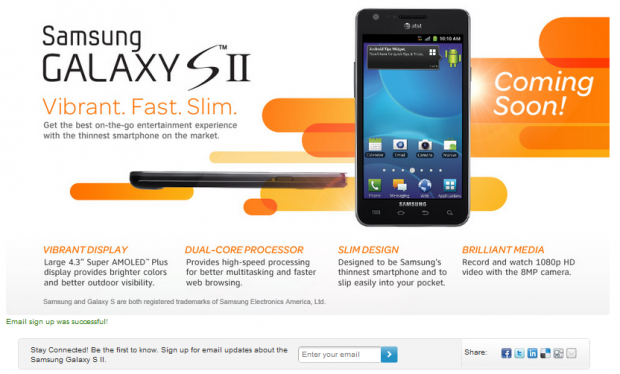 AT&T’s (NYSE:T) Samsung Galaxy S II smartphone, which I’ve had the pleasure of using as my primary phone for the last several days, will launch Oct. 2 for $199.99. Normally, I would do a full-review, but the device is certainly the baby brother to Sprint’s Samsung Galaxy S II, Epic 4G Touch smartphone, which launched Sept. 16 for $199.99 and which I reviewed earlier this month. I also created this gallery of AT&T and Sprint’s S II models. Both phones run Google’s (NASDAQ:GOOG) Android 2.3.4 “Gingerbread” operating system and both share a lot of the same attributes under the hood. AT&T’s S II is a touch lighter and leaner, at 0.35 inches thin, compared with the 0.38 inches of Sprint’s S II, and 4.3 ounces compared with 4.6 ounces for the Epic 4G Touch. Both phones are black and feature the same textured plastic back. With a 4.3-inch Super AMOLED (active-matrix organic LED) Plus display, AT&T’s unit felt more comfortable in my hand than Sprint’s gadget, whose 4.52-inch Super AMOLED Plus screen I found difficult to grip. The 4.3-inch screen is as high as I would go in a smartphone. Like Sprint’s S II, AT&T’s model is powered by a 1.2GHz, dual-core processor, whose speed improvement over existing 1GHz dual-core chips was noticeable. Both phones are 4G-capable, though only Sprint’s 4G WiMAX network was available to me; combined with the souped-up chip, the phone deftly processed YouTube content and rendered Web pages much faster. Both handsets use Samsung’s TouchWiz user interface technology, which renders widgets and other tools completely customizable across the 7 home screens. Both devices are motion-activation-capable. Users may hold two fingers on either phone and tilt to enlarge or shrink browser screen size, or press and hold on a screen to access Vlingo’s Voice Talk speech-recognition software, which will let users text, email and do searches by speaking into the phone. Sprint’s model does have a nice screen-capture feature that lets users grab and share images of screens, a feature AT&T’s S II lacks. Unlike the Epic 4G Touch, AT&T includes Facebook for Android and Qik Lite for users who want to easily access their social network, or trigger video chats from the phone’s 2MP, front-facing camera. Each phone has pretty much the same 8MP rear-facing camera, which takes great pictures with little latency and captures video in 1080p high definition. Plug in a High-Definition Multimedia Interface- (HDMI-) out cable, and you can watch your video clips on an HDTV at home. Calls were equally crisp on both S II smartphones, though I would note I always seem to have better reception on AT&T than Sprint in my neck of Connecticut. Sprint easily wins the battery power contest, boasting an 1,800mAh power source, compared with 1,650mAh for AT&T’s model. AT&T isn’t running on 4G LTE yet, so the battery didn’t get sucked down too much compared to the Epic 4G Touch, which slurped battery power while running on Sprint’s 4G WiMAX mobile broadband. In conclusion, I’d recommend either AT&T or Sprint’s S II for people who want speedy Web and application processing. If comfort in the hand is key, go with AT&T. If you don’t want to sacrifice the 4G power Sprint’s phone offers in most regions around the world, go with that model.